There are a few brands that I am loving right now and Omorovicza is one of them. I only discovered Omorovicza towards the end of 2016 and since then, I have used up and repurchased a few products, something I rarely do. So Omorovicza which is pronounced Oh - more - o - veet - za as the kind lady at the Liberty counter taught me how to say. Inspired by tradition, guided by nature and spearheading the concept of Mineral Cosmetology, the Omorovicza skincare range has a rich, romantic heritage. It was founded by a young couple, Stephen and Margaret de Heinrich de Omorovicza, who met in Budapest. Thermal Cleansing Balm (5ml) - It this is this product which started off my addition to Omorovicza and it is a multi award winning product. Designed to remove all traces of make-up, including waterproof mascara, whilst caring for the skin, this black balm features Hungarian Moor mud which works to detoxify your skin by drawing out any impurities that are clogging up your pores whilst almond oil replenishes the moisture levels in your skin. My skin adores this Moor Mud and what's more, it is enriched with a high concentration of minerals such as zinc, copper, magnesium and calcium which work to improve the production of collagen, strengthen the skin's barrier and fight against free radicals. After using my skin is so soft and smooth to the touch, it never feels as though anything was on my face, to begin with. Queen of Hungary Mist (30ml) - I absolutely love facial mists and have featured a lot of them on this blog, but this mist is quite different to anything else I have used. Taking its inspiration from a perfume first created in the 14th Century for Queen Elizabeth of Hungary, this refreshing mist is infused with Orange Blossom, Rose and Sage Waters which both purify and tone, whilst its Hydro Mineral Transference™ System works to deliver minerals deep into the skin for long-lasting hydration. The rose-scented mist rejuvenates the skin and senses to restore a soft, supple and fresh complexion and is a welcome wake up for that mid-afternoon slump. This mist is said to be Ideal for combination to normal skin types. Omorovicza Refining Facial Polish (30ml) from the You Beauty Advent Calender - This Facial Polish is enriched with calcium and magnesium to exfoliate the skin's dead cells and impurities, leaving pores purified. Again the Hydro Mineral Transference™ helps the minerals to deeply penetrate into the skin and its unique formula also contains exotic fruit extracts which plump and tone skin, whilst strengthening the surface barrier to improve firmness. Miracle Facial Oil (30ml) - If you are a fan of facial oils then this is one you definitely need to try. It has been infused with a unique blend of vitamin-rich Sea Buckthorn Berry Oil which works to rejuvenate the complexion alongside the natural plant-derived Bakuchiol which works to help reduce the look of wrinkles. Illuminating Moisturiser (30ml) - This is a cream which is ideal for dry skin, it is rich and luxurious and incredibly nourishing. Again using the Hydro Mineral Transference™ System it delivers minerals that can be absorbed by the deeper layers of skin. It is fortified with Ruby Crystal which works to minimise the appearance of fine lines and wrinkles alongside Apple Pectin and Plum and Almond Oils to provide long-lasting hydration. What I love about this moisturiser is that when applied to the skin, it almost feels like a cocoon and as it absorbs in, the soft and suppleness of the skin in amazing. I have dryness on both my cheeks and forehead and it can be a nightmare to control with the changes in weather, what I have found with this cream is that if I lather it on and allow it to sink in slowly, it works wonders. 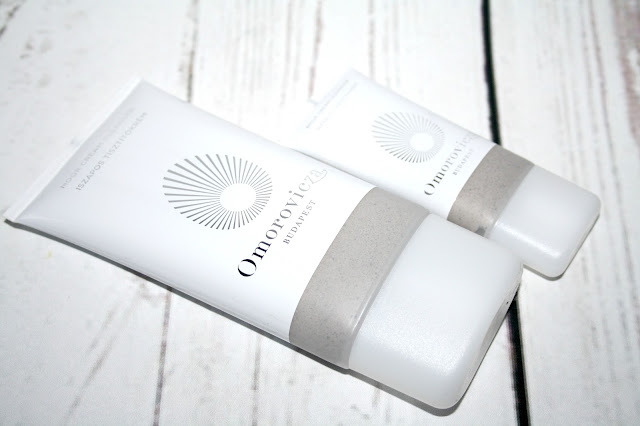 Omorovicza Cleansing Foam (25ml) is from the April Lookfantastic Beauty Box (here). This foam removes make-up, dirt, grime and impurities without stripping the skin of moisture and is devoid of harmful sulfates. Using white lupin to energise and revitalise whilst copper gluconate detoxifies the end result is skin which can breathe, it isn't dried out and I am always in two minds about moisturising as my skin is so soft after using. The foam once activated is a soft baby blue colour and has that spa scent to it and I absolutely adore it. The final item is one which is fairly new to me but is one I loved from the minute I tried it and that is the Moor Cream Cleanser. Described as being a classic cleanser with a twist, it is ideal for sensitive and dry skin. Harnessing the purifying powers of the mineral-rich Hungarian Moor Mud which comes from Lake Hévíz, the largest thermal lake in Europe, the cleanser delivers a deep pore cleanser and dissolves anything in its path - makeup, dirt, grime and even the most waterproof of mascaras are all removed. Using a cooling blend of Camphor, Peppermint and Eucalyptus Essential Oils the skin is left feeling not only soothed and revitalised. I am a huge fan of this cleanser and just love how it makes my skin feel. I am sure you can tell by now just how much I adore this brand and how amazing I think each one of these products are. I love the simplicity behind the ingredients but how effective they are. If I have peeked your interest then you can find this brand sold on LookFantastic, Cult Beauty, Feelunique, SpaceNK, John Lewis and House of Fraser with products priced from £10 right up to £300 there is a whole host of products waiting to be tried. Have you tried anything from Omorovicza before? I adore Omorovicza! I'm still mid testing some of the goodies but if I could recommend some it would be the night cream and copper peel! I am sure I have a product somewhere as I really recognise the packing! The foaming Cleanser sounds incredible!! I've not heard of this brand before! Sounds good! I really want to try the Refining Face Polish, it sounds amazing. I've been seeing this brand everywhere lately - thank you for telling us how it's pronounced. Love the sound of the moisturiser. I've never tried anything from the brand before but I would love to, it sounds so nice! I haven't tried anything from this brand but really need to! Everyone seems to love this brand and I've not tried a single thing yet - need to sort that out! I've not heard of this brand before, I love the sound of the Thermal Cleansing Balm!